Considered by serious ufologists to be the bible of modern ufology.Devoid of opinion or speculation, this book is a collection of sightings in a straight forward scientific matrix, by date/time, witness profession (Most are pilots,police, military and scientists), shape, movement.What is most striking are the multiple sighting events, which transpire sequentially, along a path, verified by multiple witnesses, whom have have no connection to one another, and all report the same object(s).The more one reads of the events, the more distinct patterns emerge.Even the governments own Project Blue Book, which set out to debunk the phenomenon, conceded that some 10% of the over 7,000 cases they studied, defied all natural and know explanations. This book focuses solely on those kind of events, that defy any terrestrial solution. The book is not really theory or narrative. Unlike many similar books, it is evidence and reports, and it is somewhat exhaustive, in its own way. I read it all the way through, and I retain it as a valuable reference volume. There is nothing like it that I am aware of. It is an encyclopaedic volume with an incredible array of reports and relatively objective evaluations of them. This is the other book Charis and I picked up while "exploring" the Central library. We joked and laughed about the "conspiracy" in play to hide all the UFO books in the hardest to find place. So, of course we had to check a couple out so we could "stick it to the (gov't) man"! 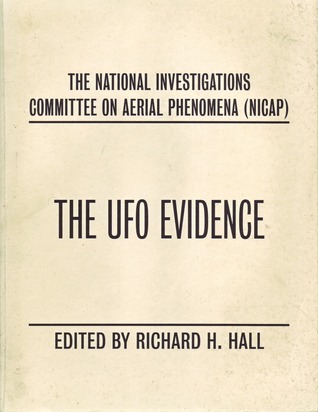 While the first book I read debunked the Roswell event, this book is a straightforward listing of sightings of the "unexplained" as reported by NICAP. Knowing I would never finish it before it had to go back, I found a copy online for 99cents. I'm now the proud owner of the UFOlogists bible! Hee, Hee! X-Files here I come!